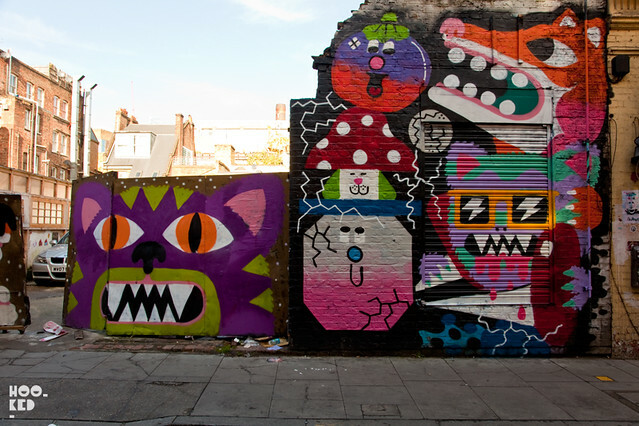 It's been some time since we saw some new street work from artists Lucas and Malarky. Both it would appear have been busy working in their studios with Malarky's Deadbeat Summer exhibition having already opened last month at the East London Lomography store and currently running at their space until the 15th November. Lucas has also been working towards a solo show at Gallery Goldstein, set to open later this month on the 29th November 2012. 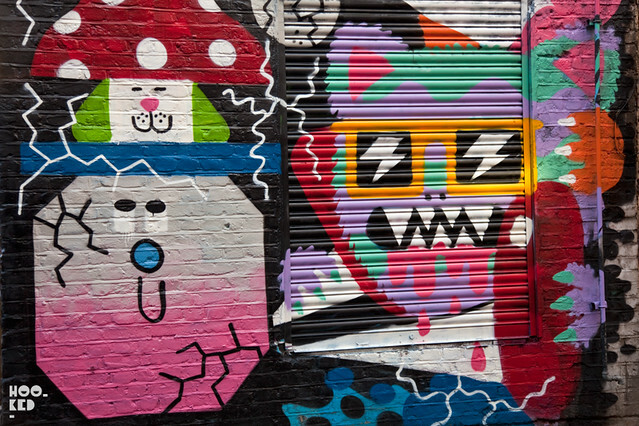 This popular spot featured is located on Hanbury Street (off Brick Lane) and recently had a colourful new splash of paint from the two artists, with Malarky also repainting the tagged up gates he had previous painted. If you are in the area be sure and pop over to the Lomography Store further down the street and catch Malarky's Deadbeat Summer show before the exhibition closes.